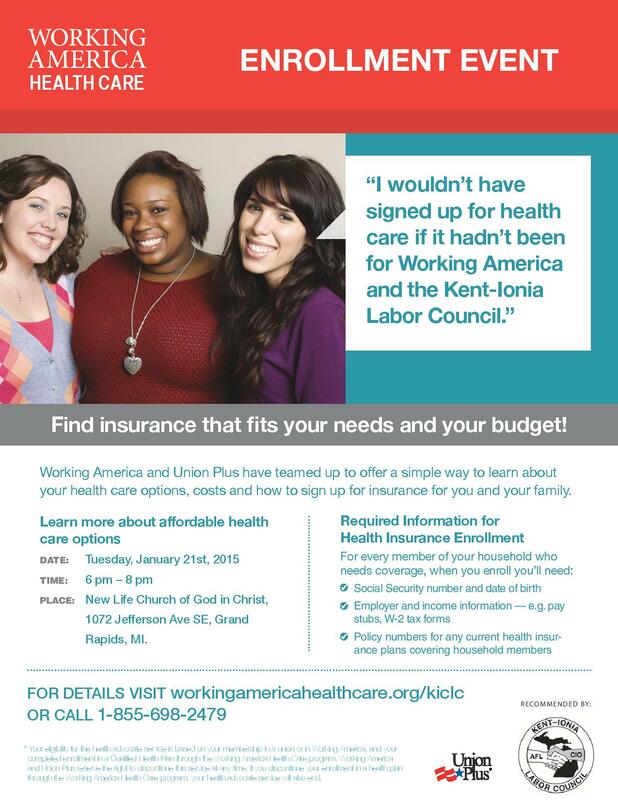 GRAND RAPIDS January 14, 2016– If you’re still without a health plan, or have questions about the Marketplace, and need some face-to-face help finding a plan that fits your needs and budget, the Kent-Ionia Labor Council is holding a Healthcare Enrollment Event on Thursday, January 21, at New Life Church of God in Christ, 1072 Jefferson Ave SE in Grand Rapids. If you just have questions, please stop by and we’ll get them answered. If you’re ready to enroll, please come to the event with the following items for everyone in your household who needs coverage: Social Security Number and date of birth, employer and income information (W-2s or pay stubs), policy numbers for any plans current health insurance plans. WHERE: New Life Church of God in Christ, 1072 Jefferson Ave SE in Grand Rapids. MORE INFO: Email Steve at steve@KICLC.org or call 616-456-8233. Click here for flyer. This entry was posted on January 14, 2016 by WMALC in Events and tagged Grand Rapids, healthcare, KICLC news, New Life Church of God in Christ, Working America.